Lead from the front of the Room with Confidence! STAND TALL is a confidence building company dedicated to teaching what it takes to lead from the front of the room with confidence through speaking, coaching, and training. After a sixteen year career in sales Sara pivoted in 2013 to business owner and professional speaker. She is a professional member of the National Speaker’s Association. Sara had the privilege of speaking on an international stage at the International Coach Federation's Global Leadership Forum. She's completed three years of Narrative Coach training at Learning Journeys International Center of Coaching. She is an Associate Certified Coach through the International Coach Federation and is the 2018 Past President of the ICF Minnesota Chapter as well as a board member of the ICF Midwest Region Advisory Council. I heard Sara speak at a Professional Sales Association breakfast on the topic of bouncing back from rejection. I appreciated her vulnerability and her humor. I also found it very refreshing that Sara didn't gloss over the hurt and difficulties associated with rejection, but encouraged us to examine how we feel honestly and then decide to take control and action. Thanks, Sara, for this fresh perspective! 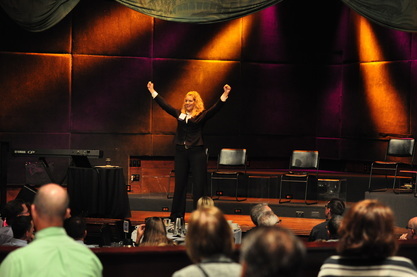 Sara recently spoke to TeamWomenMN's PowerLuncheon group, and drew our largest crowd to date! She authentically and openly offers practical advice on how to polish presentation skills that people at any level can easily implement. Sara is a true professional and delight to work with in arranging logistics of the event. I look forward to having Sara back again in the future! "Engaging, inspiring, magnetic, calm, passionate, confident and commanding - all descriptions of Sara Socwell. I had the pleasure of collaborating with Sara on a Minneapolis/St. Paul Business Journal seminar and the experience was very positive and enlightening. I would recommend Sara for your event and as a presentation coach." "Sara has the ability to draw the audience in from the get-go, and keep them engaged throughout. Her presentation style is dynamic yet authentic. She delivers with confidence and passion, while remaining approachable. She is genuinely interested in helping others to learn the techniques that will lead to successful presentations, and is a great coach and mentor." "I heard Sara present Six Techniques to Own the Room at the March 2015 Business Leaders Breakfast Forum. Sara did a great job connecting with her audience. She delivered a great message that we all can add to our toolkit in a concise style. It's nice when you can learn from someone who also has one of those personalities that add a little sunshine to the day." Ann Slavec Business Development - Strategic Planning Manager at DDL, Inc.